Acorn Hill Academy: Loving Legos! Last night, we went on a family outing to the closest Lego store, about an hour away, to build their monthly free kit. We learned about this monthly opportunity when the kids and I trekked down there in November, seeking Christmas gifts and hopefully pieces to make Christmas ornaments from this site (we didn't get the ornament pieces; we have to special order those). I confess that I wasn't thrilled to drive all the way down there, but Todd came with us, so that made it all right. I learned from another mom in line that the mall we visited is the main tourist attraction in North Carolina, beating out the beaches, the Outer Banks, the mountains, and everything in between. Isn't that a disturbing thought? When we arrived, the line from the door was a rather lengthy snake that looped around the kiddie rides in the middle of the mall hallway and back past another store. I should have expected that, I suppose. The good news was that once it hit 5 o'clock, the designated start time, the line moved quickly. It was REALLY long when we got there and we only waited about an hour, including the 15 minutes we were early. 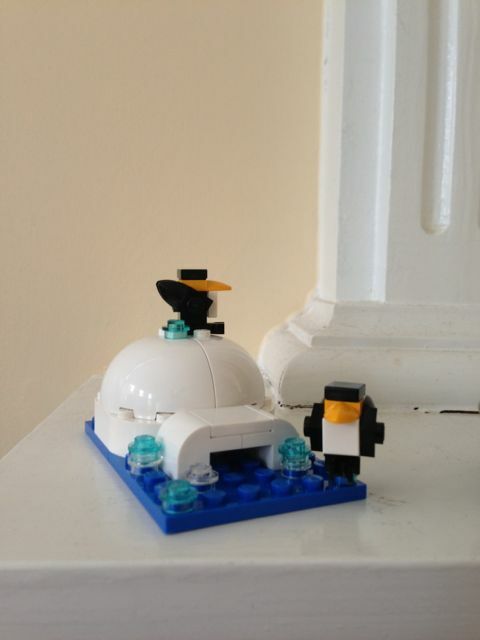 The kit for this month was a cute little igloo with penguins. Each child got to build one. Well, the age range is from 6-14 (although they were quite lenient). "Big" Lego-loving children, like Todd, just got to help the little people. We also had little gift boxes they'd given us on our previous visit, one for each child, which we were allowed to fill for free from the brick wall. If you've never been, each Lego store has a wall filled with containers of various Lego pieces, and the pieces change over time. Isaac had a wonderful time filling the little boxes - that's how he kept busy during the hour wait to build our little kits. We also have a refillable container from the Lego store, and Todd filled that one. He still loves Legos and was impressed with some of the pieces he found. He said he chose the "higher-end specialty pieces," and said he would go back on a regular basis to refill the little bucket. He even said we could make this a monthly family thing! 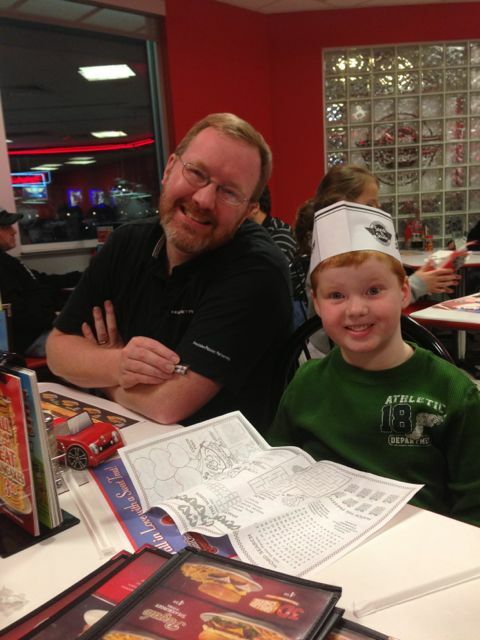 We had dinner afterwards at Steak n' Shake, which is one of our favorite places to eat. There isn't one close to our house, so we usually only get to stop there when we're on our annual trip to Michigan. Everyone was excited to find one closer to home. Isaac looks a little manic. 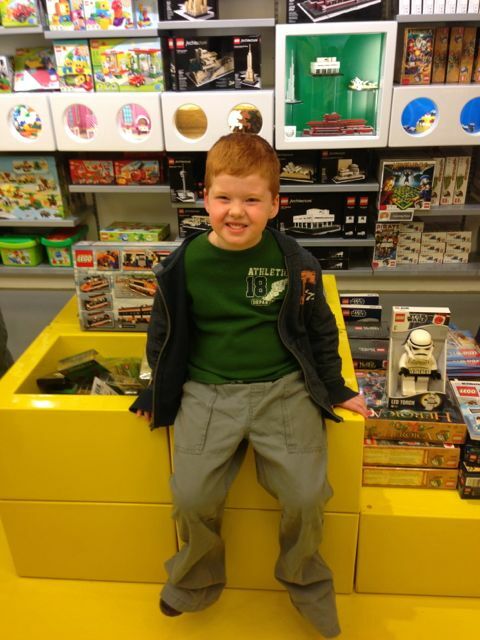 Apparently all that time in a Lego store can affect one's brain. This morning, all three kids spent quite a bit of time poking through the Legos, making random things. I love watching them do that. Isaac loves to build cars, and he has elaborate explanations of the things he makes. I do not have the "Lego gene," if you know what I mean. Todd does, obviously, and Isaac seems to have inherited it, too. In addition to building, Isaac has been sorting pieces into plastic bags. He loves to put just about anything that will fit into plastic bags. I get a kick out of watching him. Have you been to the Lego store for the monthly kit? What did you think?